Chanel Joues Contrate Blush Rose Initiale (available here) - $43 Part of the Les Essentiels de Chanel makeup collection for Fall 2012. Chanel's newest Joues Contrate - Rose Initiale - is a light shade of pink. In the pan, it looks mostly pink, though on my skin I detect maybe a tiny hint of peach to it (which might be because of the fine shimmer that gives a glow to the skin). Like most of the Chanel powder products, this too is perfumed, not something that bothers me overly but might be an issue for anyone with a sensitive nose. Texture-wise, this is a powder version and not a baked version that I have always got back in India - and I think I prefer these to the baked versions. A next generation lipgloss with colour so rich and shine so intense, it could only be inspired by the iconic lipstick, Rouge Allure. Bold colour combines with the smoothest, silkiest gel texture for luxurious wear and deeply dramatic effect. Lips feel comfortable – never sticky or tacky – and look luminous, full and sensuous for hours. The double-sided, flocked applicator is beveled to deliver ultra-precise definition. Chanel has released two new glossimers with Les Essentiels de Chanel collection for fall 2012 - Troublant and Caprice. The Rougle Allure Extrait de Gloss formula is something of a hybrid between a gloss and a lipstick, the smooth moisturizing texture of a gloss and the pigmentation of a lipstick. 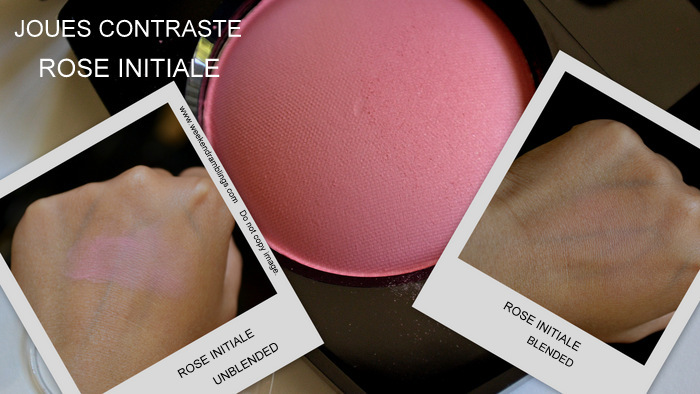 Troublant is a mauve-plum shade while Caprice is a pale milky pink with a hint of coral to it. 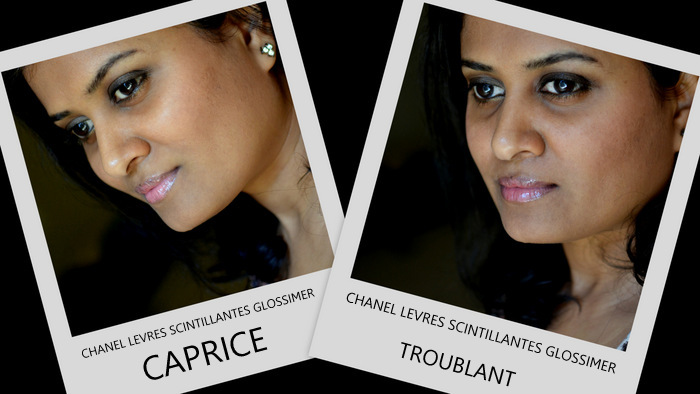 Chanel Rouge Extrait de Gloss in Caprice and Troublant - My Take: True to the formula, Caprice and Toublant are like thick lipglosses, but I found them on the sheer side - as sheer as any other regular lipgloss, only just a lot thicker. Caprice is a milky pink with just a hint of coral. A very sheer milky shade, it doesn't do anything for my very pigmented lips when used on its own. Topped over a darker lipstick/lipliner, it would work great paired with a darker, smokey eye. Trouble - described as a dark plum - sheers down to an almost my-lip-but-glossier shade for me. Again, this would work better with a lipliner to layer over. Both the glossimers are nondrying but I am not too sure about the longlasting claim - about 2 to 3 hours is the maximum wear I get, and of course, they don't last through a meal. Overall, the quality and packaging is awesome, its Chanel, but I would think they are colours that you can easily find less expensive dupes for. Les Essentiels de Chanel for Fall 2012 (available here) - A chic makeup collection inspired by Coco Chanel's iconic essentials. Pretty early in the year for a fall collection one would think, but makeup companies obviously think differently. A lot of fall collections are turning up at counters, and the first one I picked up was the one from Chanel - Les Essentiels de Chanel. Featuring traditional fall makeup trends of plum lipsticks, dark nail polishes, and metallic shimmers in the eyeshadows, this collection would seem just great for fall, but Chanel has also thrown in some beige and brights so it doesn't look too out of place around this time of year. I picked up a couple of pieces, and here are some swatches. Reviews to come in a bit. 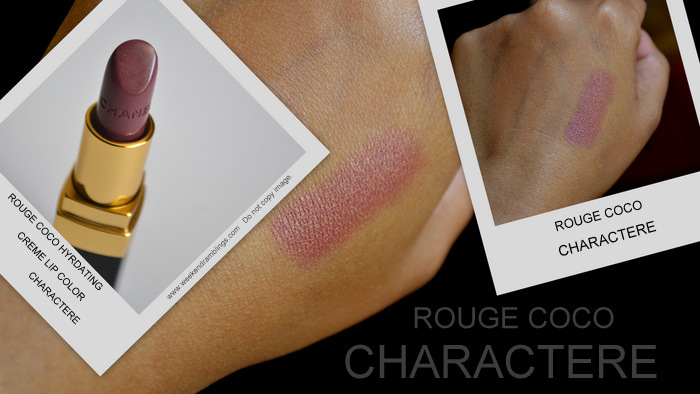 Chanel Joues Contraste Rose Initiale Reviews/FOTD HERE. It's not yet July, and summer is just starting here, but in the world of makeup it's already autumn! While I was waiting for the Bombay Express collection from Chanel (which is currently available online), pieces from the fall 2012 collection - Les Essentiels de Chanel - were already available at Nordstrom. Thanks to their fabulous (and free) shipping service, I got a few of the products. 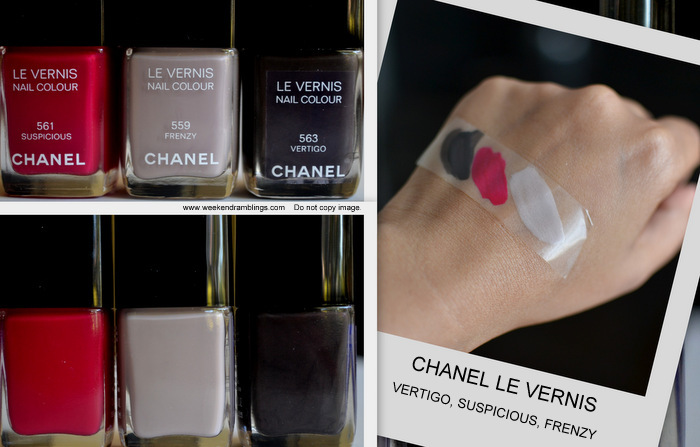 My favorite is the Chanel nail polish - Vertigo. Vertigo is a dark reddish-brownish grey - so dark it's almost black. There is a fine shimmer scattered throughout the polish, but had I not read about this in other blogs I would have never known. The polish looks a dull, dark grey in the bottle, and I was a bit disappointed when I saw it. On my nails, it goes on a creamy, dark grey with undertones of maroon and brown. There is no sparkle or shimmer visible (very typical of so many Chanel polishes), but it does give a depth and complexity to the color and makes it just so beautiful. Two coats of Chanel Le Vernis Vertigo on my nails. 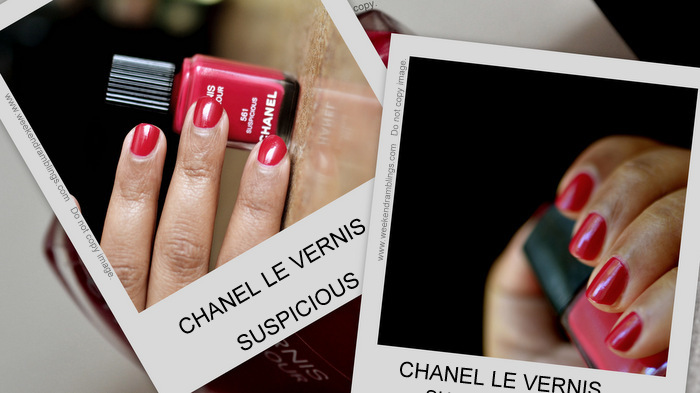 Chanel Le Vernis Vertigo is a fabulous, creamy dark color that is perfect for fall but would not look out of place any time of the year. Unlike so many other darker colours, this makes my hands look healthier and brighter. The formula is amazing, and if you are good with your application, you could get away with a single coat. I don't own Paradoxal or Black Satin - the two colors that this might look similar to - so I cannot do side by side photos right now, but in my opinion, Paradoxal has just too much purple in it while Black Satin is, well, just black. I would check this post by Sabrina from The Beauty Look Book to get an idea about comparisons with other/similar colors. Reveal softer, glowing skin with exfoliating salt grains and organic sugar in a moisturizing, oil-based scrub that has a fresh, classic scent. Community Trade shea butter has antioxidant vitamins A and E to help protect and nourish skin. Community Trade organic soy oil is very rich in essential fatty acids that help to repair skin’s moisture barrier, so skin is smooth and supple. Community Trade organic sugar and salt grains gently exfoliate skin. The Body Shop makes some of favorite body butters, and while I love the fresh, fruity scrubs that they make, I am always looking for ideas to cut down on the work involved - you know, scrubbing, moisturizing, it's all too tiring :P Anyway, I found an easy solution in the Body Shop Shea Butter Body Scrub - a great-smelling scrub that combines the gentle exfoliating power of salt and sugar with the superbly moisturizing shea butter. The Body Shop Shea Butter Body scrub is a creamy, yummy scrub that's rich in oils and so perhaps best suited for the dry-skinned girls. It's also a very gentle scrub - the salt granules are very fine and the sugar granules are just too big to be too harsh - perfect for sensitive skins. To use, scoop a generous amount of the scrub and apply to damp skin. The shea butter and soybean/sunflower/castor oil base makes this a perfect scrub to massage into the skin - would be ideal if someone else did it for you, but for the not-so-lucky-normals like me, we just have to do it ourselves :D Wash off with warm water and towel dry for perfectly moisturized skin! I say "perfectly moisturized," but that's because I have very dry skin and I prefer light oils rather than lotions for my skin. Normal skins might find this a little on the oilier side, but it does get absorbed after a bit. The fabulous scent stays on the skin for a quite a while. Overall, I find this a great product, especially for a dry/sensitive-skinned person looking to streamline the daily skincare routine. I do find it a trifle oily, not something I am complaining about for my skin, but it does tend to leave the bath tub slippery (I just wash off the surface with soapy water, but it's something to keep in mind if you are prone to slipping). As much as the fragrance, the packaging of Angel is quite distinct - a bluish-tinted glass star, a technically challenging design that took nearly 2 years to perfect. With it's peculiar star-shaped bottle and the many passionate reviews about this "dirty perfume," Angel has been on my must-try list for quite some time now. Soon as I got my bottle of Angel, I took a deep whiff straight off the bottle, and I HATED it. Not surprising really, considering that is what most reviews warn you not to do, but I didn't really think it was all true! What is also true, though, is this is a fragrance that grows on you. I would describe Angel as a heady, cloyingly sweet perfume, with a massive overdose of patchouli. While the smell never really changes on my skin, I love the fragrance in the air around me. A tiny drop on my wrists is enough to give me a whiff all through the day, and I love how the fragrance drifts up into the air as it gets warmer (of if I have my hands under warm water). Sensual and dark, this is a fragrance I like smelling on myself - at home. Much as I seem to like it, I doubt if I would ever wear it out; it's really not what I like smelling like to a stranger. Look good. Feel good. Do good. This pure scent adds a fresh drop of verbena to a world that needs a moment of calm. More than a fragrance, it embraces a way of being that takes time out for the simple things, the things closest to the heart: love, joy, comfort, relationships, and community. This fragrance's verbena calls to mind sparkling citrus and crisp green basil -- a naturally derived ingredient sourced from Africa. The scent's overall character is fresh and bright. A light mix of floral notes, including honeysuckle, peony, jasmine petals, is balanced with a finish of white amber, sea moss, and vetiver. The bottle, organic in shape and inspired by a drop of water, appears to be formed by nature. The materials include 100% recyclable glass and a cap of high-purity aluminum. Its compostable box is made of sustainably harvested paper manufactured in a mill that uses 100% renewable energy. Notes: Verbena, Honeysuckle, Peony, Jasmine Petals, White Amber, Sea Moss, and Vetiver. Fragrance descriptions, names, bottle designs, packaging - companies spend a lot of time and money on all this (sometimes, imo, more than they do on what they spend on the actual fragrance), yet most times it all just doesn't make sense to me. I just don't get the connection between the fragrance I smell and all the fantasy built around it. The pureDKNY Verbena is one of those rare fragrances where it all fits in. From the drop-shaped minimalistic design of the bottle to the clean fresh fragrance, there isn't a single discordant note in this perfume. I would describe this as a fresh, mildly citrusy floral and a very light and clean smell. A subtle scent, this is perfect for the spring/summer days, but also for any time you want to smell good without being too overbearing or obvious. It doesn't last too long on me, though, or at least I could not smell it after a while. Layering the spray over the body butter would probably solve that issue. If you love being enveloped in a captivating fragrance which inspires you, you will love this fragrance with its sensuous union of iconic feminine jasmine, with indulgent notes of vanilla, sandalwood and musk cream. Especially created by The Body Shop with one of the world's finest "noses", Dominique Ropion , even the name chosen signifies love in all its forms. You don't have to change the world wearing this fragrance, but you will love that this is the first Eau de Parfum to feature an alcohol perfume base created from an ingredient which is fairly-traded and organic. The Body Shop Love ETC... perfume range is the perfect scent for those who like their fragrances with a dash of vanilla mingled with a musky woody note. The top notes of neroli, bergamot, and pear give it a slightly spicy/fruity opening note. What I love most about this perfume is the way all the notes blend together seamlessly, though vanilla is what I breathe in the most. There is a warmth to the perfume as it dries down, with the vanilla mixing with the musky creamy notes and giving this a more rounded (not sickly) sweetness. Inexpensive and long-lasting (especially when I layer this over the yummy body butter), this is a perfect scent for the vanilla-loving girl. Complete List of Perfume Reviews, check here. They were mixing colors in the lab and I said, "Stop!," Philips recalls. I took a look at the shade and thought, "This is kind of particular. It's not gray and it's not beige, it's kind of weird." He brought the shade to the women he works with, and they couldn't wait to put it on. "I know when I like a color, but that doesn't mean it makes a good nail polish," said the Belgian-born Philips, who can be credited with helping to legitimize funky nail polish colors and making them acceptable for all women to wear, no matter their age or occupation. - Chanel Makeup Guru Peter Philips (read full article here). Chanel Particuliere brings the best of neutral beige to a dark nail polish. A simple, classy color, that you just cannot go wrong with! So, what about you..what's on your nails this week? A shimmering champagne eye shadow primer, this triple-duty product also works as a highlighter or eye shadow. The bestselling champagne shade is soft, versatile, and provides the ultimate eye prep for creaseless, more vibrant shadow and all-day wear. The most legendary primer in the beauty industry, the Urban Decay Eyeshadow Primer Potion is coveted by makeup artists and makeup junkies alike because it guarantees more vibrant eyeshadow that lasts for 24 hours and never creases! Once you experience its powers plus how smoothly it glides on, you’ll never want to live without it. I have wanted to try the much raved-about Urban Decay primer potions for ages, and now that I can, I picked up all 4 versions of this genie-in-a-bottle product. I love the UDDP Original, and the Urban Decay Primer Potion in Sin is just as good! Available in easy-to-use squeeze tube packaging, I have the older bottle packaging that comes with a flocked applicator. I know from reading through rants on this, at some point in time getting product out would be a pain, but right now I have no such issues. Sin is a shimmery champagne color, and you only need the tiniest amount to cover the eyelid (even my saucer-huge eyelids!). It feels creamy and glides on easily on the skin, drying to a champagne sheen in a minute or so. In my swatches, I have used a generous amount for a heavy swatch - you really don't need that much for actual use. Compared to Original version, I find the Urban Decay Primer Potion in Sin has a drier finish. Might be just my experience, but I feel if you have oily lids, this might seem easier to apply than the original version. Because of the shimmery champagne finish, this would also work great as a shadow/highlighter when used on it's own. In terms of performance, this is just superb! It grabs on to the eyeshadow, brings out the vibrancy in the shade, and helps the shadow stay on the whole day without any creasing or fading. I have swatched a matte black eye shadow, both with and without the primer, and the difference is quite obvious. 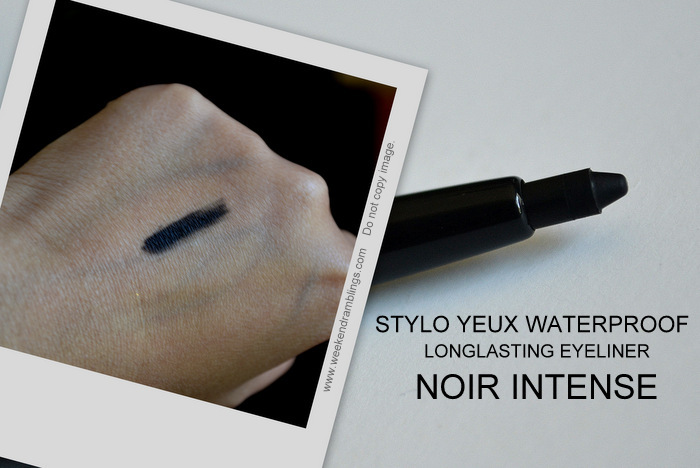 Urban Decay Primer Potion in Sin: Matte black eyeshadow swatch test. Left: Swatch without primer. Right: Swatch over primer. I remember reading in a makeup book some time back that the UD primer helps the shadow stay on through a shower! I didn't see any claims of it being waterproof listed anywhere, but I did try holding my hand under running water and wiping off the shadow with a towel. The swatch over the primer help up pretty well, didn't it?